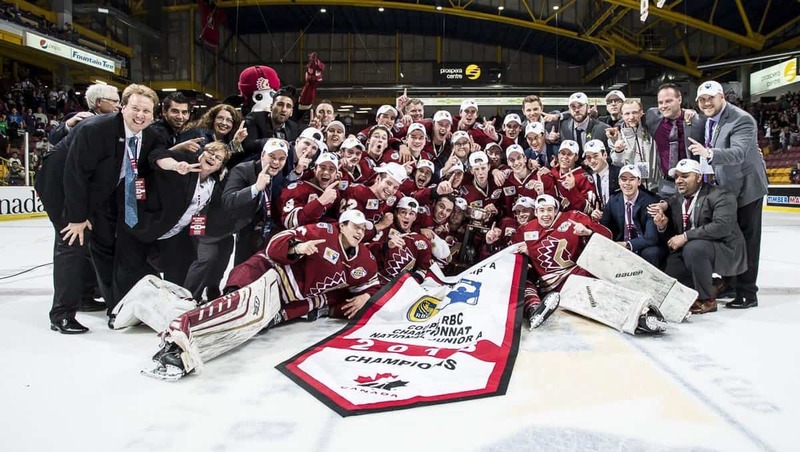 The RBC Cup is the pinnacle of junior A hockey in Canada. For some goalies, like Connor Hicks, this is the culmination of years of hard work. For others, like Matthew Thiessen, it’s just the beginning of a spotlight that will only grow larger and larger. This year the annual tournament was held in Chilliwack, British Columbia – home of the Chilliwack Chiefs of the British Columbia Hockey League. The host Chiefs received a bye into the tournament after being eliminated in the first round of the BCHL playoffs by the Prince George Spruce Kings. By the time the tournament began the team had been out of action for over a month and a half – which was a unique challenge for goaltenders Daniel Chenard and Mathieu Caron. The Wenatchee Wild, the lone American BCHL team, won the league championship and defeated the Spruce Grove Saints of the Alberta Junior Hockey League to win the Doyle Cup and earn their spot in the tournament. The Wild were the favourites coming into the tournament, and absolutely dominated teams on certain nights throughout the year. 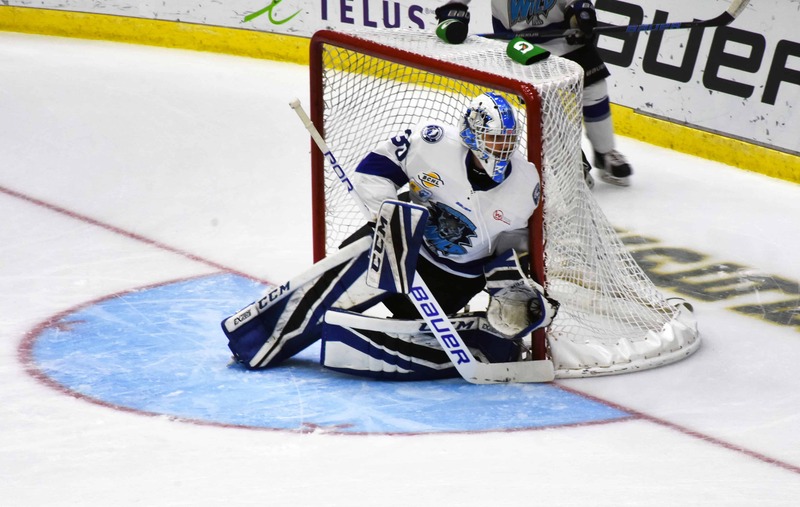 Goaltenders Austin Park and Seth Eisele were both rookies, but helped backstop the team to its most successful season in history. The three other teams that qualified regionally included the MJHL’s Steinbach Pistons, the OJHL’s Wellington Dukes, and the CCHL’s Ottawa Jr. Senators. The Jr. 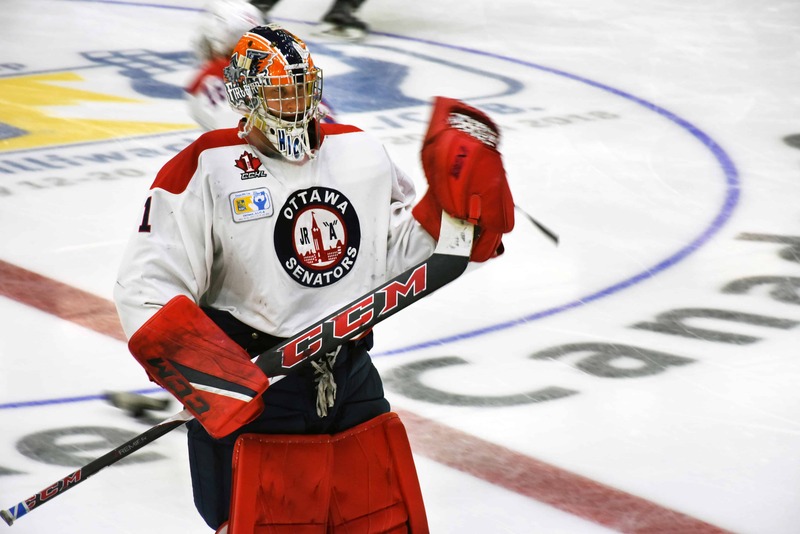 Senators boasted the veteran leadership of Connor Hicks in goal, the Pistons brought the fourth-ranked North American goaltender for this year’s NHL draft in Matthew Thiessen, and the Wellington Dukes relied on the scrappy goaltending of Jonah Capriotti. Wenatchee was the clear favourite team heading into the tournament, coming in after an overwhelming performance in the Doyle Cup. They would routinely outshoot teams in the BCHL, especially at their home rink at the Town Toyota Center. Averaging a shade under 3,000 fans per game, it was arguably the most intimidating place to play in junior hockey during the 2017-18 season. That shot discrepancy presents a unique challenge for the goalies. In some games they would go a few minutes without seeing any action at all. Adding to the frustration, the home rink was also notorious for skewing the shot numbers to make the differential look even worse than it actually was. For a goaltender that is trying to achieve a scholarship, this doesn’t fly. His backup Seth Eisele agreed that it hurts to be cheated out of credit for saves, but it’s something that you can’t let affect your mentality. At the end of the day they both agreed that NCAA schools will do their research before committing to any player. 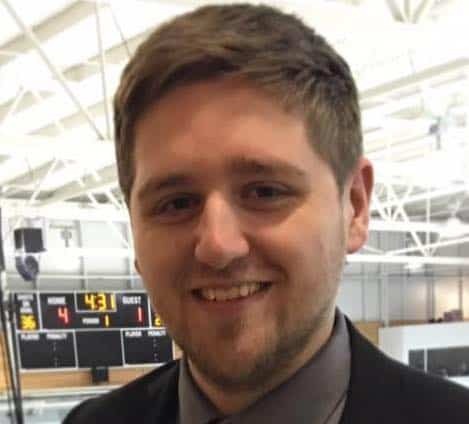 Even though hockey is trending in a statistical direction, especially through scouting prospects, their hope is that the scouts will give proper due diligence and not just glance at the box score. For a Kanata native like Connor Hicks, there was no better feeling than returning home to lead his local junior A team to the Royal Bank Cup. The use of the word “lead” is no overstatement, either. After starting the year with the Sault Ste. Marie Greyhounds of the OHL, Hicks would go on to appear in 26 games with the Jr. Senators posting a .933 save percentage. He followed that up with a .920 in the 17 playoff games that it would take to win the CCHL championship. Not a bad send off for his final year of junior hockey. Hicks will be joining the upstart Dalhousie University program in 2018-19, and brings more than his fair share of experience to the team considering he appeared in over 100 OHL games during his junior career. As a goaltender with an ideal 6-foot-4 frame, learning to use it effectively is a work in progress – even at age 21. This has been a major focus for Hicks and his goalie coach Andrew Mercer of Amped Sports Lab in Ottawa. Goalies are seemingly always developing, and the learning situations continued even while at the RBC Cup. Because of his size, Hicks loves to employ the overlap technique. While it is fantastic at taking away the front-door and short side options for a shooter – it can sometimes be susceptible to back-door plays. The Wild’s AJ Vanderbeck took advantage of that in Ottawa’s second game, slipping a back door pass to teammate Matt Dorsey on the powerplay for their first goal. Because of his size, Hicks loves to employ the overlap technique. While it is fantastic at taking away the front-door and short side options for a shooter – it can sometimes be susceptible to back-door plays. Thus is the life of a goaltender. Always evolving and learning the game, even in the final tournament of their junior career. The path to the RBC Cup was an interesting one for Wellington Dukes goaltender Jonah Capriotti. 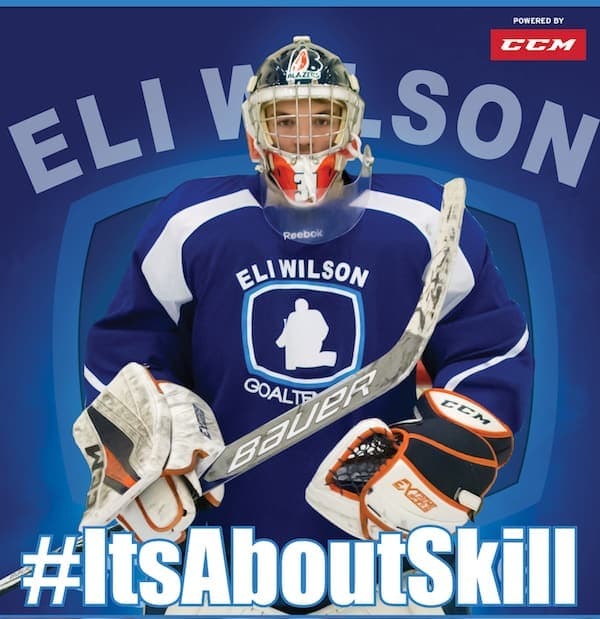 The Ontario-born netminder decided to go the US prep school route, which eventually helped earn him a spot in the OJHL with Wellington at 18 years old. Even though he still has another year of junior eligibility, he has decided to forgo it and will join Trinity College in 2018-19 – a Division III NCAA program. A tough-but-admirable decision for a young man who seems fully in control of his destiny. This is just another example of the real challenges that young hockey players are faced with at an early age. Capriotti seems at peace with his decision. Going to a program that really wants you to be there was an important factor for him. Despite some excellent statistics, drawing interest from division I programs has been tough for Capriotti. The reason? He’s listed at 6-feet tall, but likely clocks in at a shade below that mark. As far as division III programs go, Trinity College is one of the best around. Located in Hartford, Connecticut, they are generally a top team in New England’s NESCAC conference. Capriotti certainly capped his junior career with a bang. 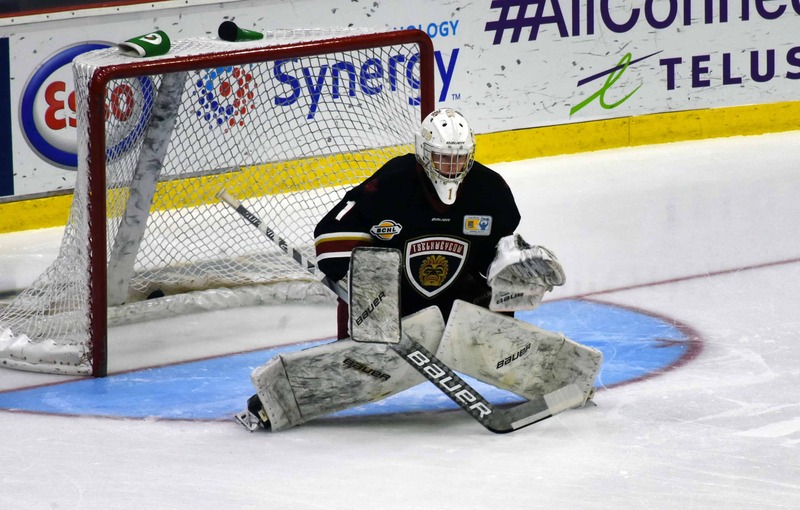 A remarkable fifty-save performance helped upend the tournament-favourite Wenatchee Wild in the semi-finals – before falling in a heartbreaker to the host Chilliwack Chiefs in the final. Perhaps this was his way of showing scouts what they were missing out on because of their thoughts about a couple of numbers in the height column on his bio page. One of the most highly-anticipated players to watch in the tournament, at least for scouts, was Steinbach Pistons goalie Matthew Thiessen. Thiessen was ranked 4th in the NHL Central Scouting ranking of North American goaltenders available for the 2018 NHL Entry Draft. 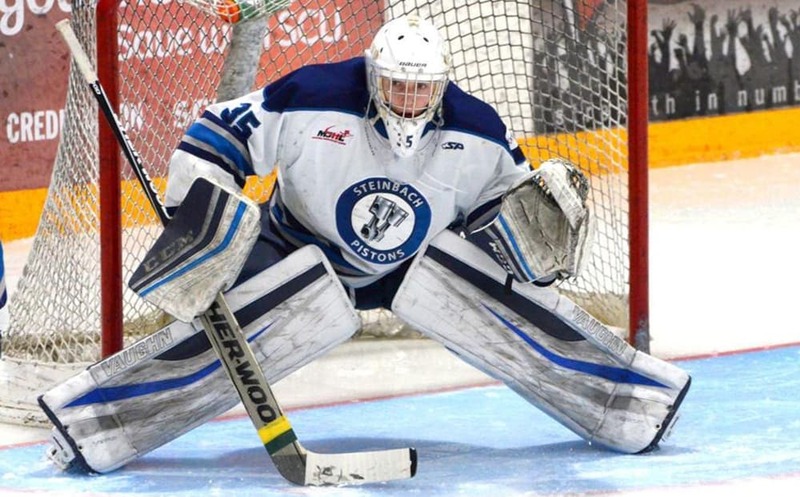 The 6-foot-2 netminder backstopped his team to an MJHL championship with an impressive .943 save percentage in 14 games, then took the ANAVET Cup in 6 games to earn a berth in the RBC Cup. Although he is a highly-ranked prospect, there are some doubts because of the league he plays in. The MJHL isn’t the most well-known or heavily scouted league of the junior A circuit, so getting to see him play against the talent in a best-on-best tournament was important for a lot of talent evaluators. Unfortunately, his tournament was cut short after he suffered a freak ankle injury while retreating back into his net after playing a puck. The injury wasn’t overly serious, but it was enough to have him walking with the aid of a crutch after the game. The Pistons were also the first team eliminated during round robin play, so Thiessen never received the second chance that he was hoping to get. Thiessen will be heading to the University of Maine in two years time, but for now his focus is on the upcoming draft in Dallas. Next season? 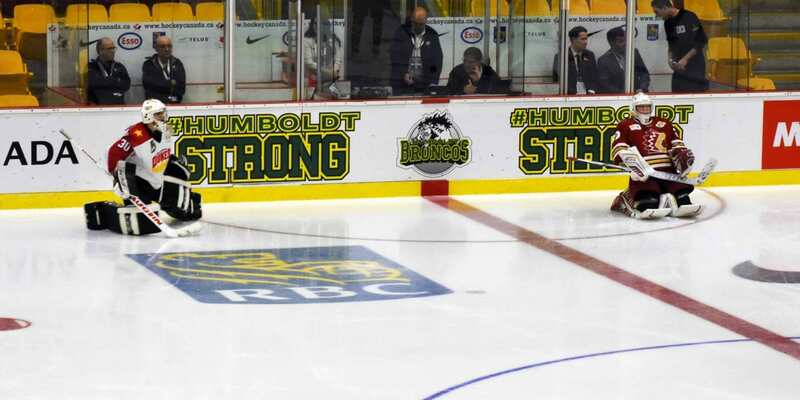 It’s about getting back to the RBC Cup for a second opportunity. Chilliwack’s goaltenders had one of the most unique situations of all heading into the RBC Cup. Because of a first round exit at the hands of the Prince George Spruce Kings, the team had a nearly two-month long break between games. As the host team, expectations were still high. To make matters even more interesting, the team fired their head coach days ahead of the tournament’s opener. Stress levels should have been at an all-time high for Daniel Chenard and Mathieu Caron, two goaltenders with limited junior experience, but they didn’t let it get to them. The players took a two-week break to relax, then came back fully rested and ready to go. Keeping the pace up seemed to be the key, although nothing can truly replicate the speed of a game situation. The players needed to push each other to make sure that they were ready to face the best-of-the-best junior A teams that were all coming off league championships. In the end it was the friendship between Chenard and Caron that put them over the edge. The Chiefs were able to pull off the unthinkable: Winning the RBC Cup after a massive layoff, completely redeeming a season filled with turmoil and disappointment. Doing it with two young, unproven netminders only adds to the intrigue. And win is exactly what they did.